The University of Florida (commonly referred to as Florida or UF) is an American public land-grant, sea-grant, and space-grant research university located on a 2,000-acre (8.1 km2) campus in Gainesville, Florida. It is a senior member of the State University System of Florida and traces its historical origins to 1853, and has operated continuously on its present Gainesville campus since September 1906. 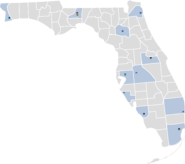 The University of Florida is one of sixty-two elected member institutions of the Association of American Universities (AAU), the association of preeminent North American research universities, and the only AAU member university located in Florida. The University is classified as a Research University with Very High Research by the Carnegie Foundation for the Advancement of Teaching. Following the creation of performance standards by the Florida state legislature in 2013, the Florida Board of Governors designated the University of Florida as one of the two "preeminent universities" among the twelve universities of the State University System of Florida. In 2015, U.S. News & World Report ranked Florida as the fourteenth best public university in the United States. The university is accredited by the Southern Association of Colleges and Schools (SACS). It is the third largest Florida university by student population, and is the eighth largest single-campus university in the United States with 49,913 students enrolled for the fall 2012 semester. The University of Florida is home to sixteen academic colleges and more than 150 research centers and institutes. It offers multiple graduate professional programs-including business administration, engineering, law, dentistry, medicine, and veterinary medicine-on one contiguous campus, and administers 123 master's degree programs and seventy-six doctoral degree programs in eighty-seven schools and departments. The University of Florida's intercollegiate sports teams, commonly known by their "Florida Gators" nickname, compete in National Collegiate Athletic Association (NCAA) Division I and the Southeastern Conference (SEC). In their 108-year history, the university's varsity sports teams have won thirty-five national team championships, thirty of which are NCAA titles, and Gator athletes have won 275 individual national championships. On January 6, 1853, Governor Thomas Brown signed a bill that provided public support for higher education in the state of Florida. Gilbert Kingsbury was the first person to take advantage of the legislation, and established the East Florida Seminary, which operated until the outbreak of the Civil War in 1861. The East Florida Seminary was the first state-supported institution of higher learning in Florida. James Henry Roper, an educator from North Carolina and a state senator from Alachua County, had opened a school in Gainesville, the Gainesville Academy, in 1858. In 1866, Roper offered his land and school to the State of Florida in exchange for the relocation of the East Florida Seminary to Gainesville. What are the academic rankings for University of Florida? 1. number 43 for Academics. 2. number 38 for ROI (Return on Investment). What universities are similar to University of Florida?